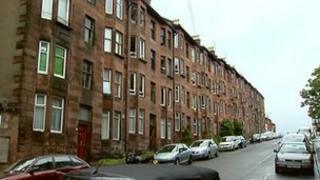 A 53-year-old man has died in a fire at a flat in the East End of Glasgow. Firefighters were called to the tenement building in Aberfoyle Street at 21:11 on Friday. One man was rescued from his first-floor flat after eight firefighters fought heat and dense smoke, but he was declared dead by paramedics. The cause of the fire is being investigated but Strathclyde Police said at this stage it did not appear to be suspicious. Four Strathclyde Fire and Rescue Service fire appliances, two from Springburn and the others from Calton and Cowcaddens, were called to the four-storey building.